HARARE, Zimbabwe -- Zimbabwe's president on Tuesday said "unacceptable" violence by security forces will be investigated after a days-long crackdown on economic unrest, while a doctor said the 12 documented deaths and more than 300 people wounded are likely "are just a fraction of the actual victims." Zimbabwe's military is in the streets for the first time since post-election violence in August killed six people. This time, people report being hunted down in their homes. More than 600 people have been arrested, most denied bail. The pattern of injuries seen in the more than 300 people wounded and 12 dead suggested premeditation and training in torture, Matara said, and "we think these numbers are just a fraction of the actual victims" as some were too scared to seek treatment. Some medical professionals, accused of "trying to subvert the government" by publicizing the toll, are now afraid to help victims, Matara said. Zimbabwe's president said insubordination will not be tolerated and "if required, heads will roll." Mnangagwa's government has blamed the opposition, despite witness accounts of security forces killing or wounding bystanders, including a 17-year-old . "Everyone has the right to protest, but this was not a peaceful protest," Mnangagwa said. The government-backed Zimbabwe Human Rights Commission said eight people were killed and criticized the use of the military and live ammunition. It said the government had not learned from the August crackdown, and should compensate "victims of military and police brutality." The opposition called Mnangagwa's new call for dialogue a "gimmick to buy time." MDC leader Nelson Chamisa said his attempts at dialogue had been "spurned and mocked" and that people must be free to talk without fear. Arrests continued. Zimbabwe Lawyers for Human Rights said police detained labour federation leader Japhet Moyo overnight, just hours after releasing him. He is charged with subversion for his role in organizing the national strike along with pastor and activist Evan Mawarire. Police also detained 28 people being treated at a hospital in the capital, Harare, the lawyers' group said, calling it "very inhumane." 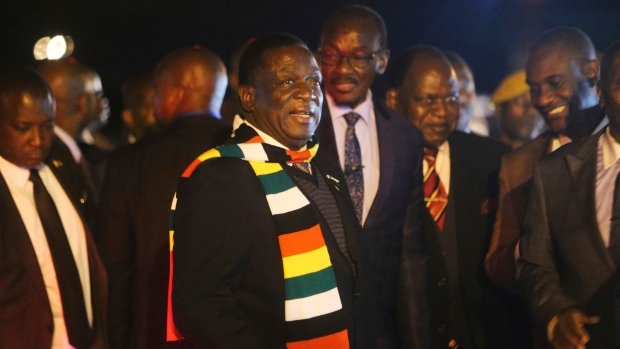 At Davos, Mnangagwa had planned to appeal for foreign investment and loans but faced a more difficult reception than a year ago, when optimism was relatively high about a "new Zimbabwe." Neighboring South Africa recently turned down Mnangagwa's request for a $1.2 billion loan. South Africa is now considering a bailout for Zimbabwe "as long as it is affordable for our side," Foreign Minister Lindiwe Sisulu said. Meanwhile, President Cyril Ramaphosa again suggested that U.S. and other sanctions on Zimbabwe be lifted or relaxed. Zimbabwe Finance Minister Mthuli Ncube told The Associated Press in Davos that "we don't need to be told by anyone that we need to do better on human rights or open up democratic space ... we need to do it for ourselves." He hopes to gain access to some $500 million in lines of credit at Davos. Zimbabwe's turmoil again brought questions about tensions between Mnangagwa and the man he had left in charge, hard-line Vice-President Constantino Chiwenga, who had led the military effort to oust Mugabe. Mnangagwa and Chiwenga have dismissed reports of a rift, and they hugged upon the president's return late Monday. "This is state-sponsored violence," Dewa Mavhinga, the southern African director for Human Rights Watch, told reporters. He called Mnangagwa's government the same as that of Mugabe but with "an even more brazen system in charge."